LEGO Star Wars is celebrating its twentieth anniversary in 2019. Now therefore seems like an excellent opportunity to test your knowledge of this enduring theme with our LEGO Star Wars Trivia Challenge! Questions of varied difficulties have been compiled and we are beginning with a multiple choice challenge, consisting of twenty questions. Further challenges will be published during the next couple of weeks. 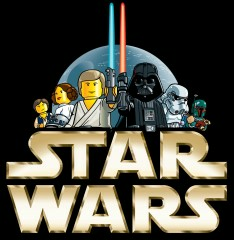 You can choose to test your memory of LEGO Star Wars or research the answers on Brickset. When you have answered every question, click submit and scroll back towards the top of the page to view your result. Remember to read the questions carefully and good luck! Let us know how you performed in the comments but please refrain from revealing the answers. 10/20 not brilliant but not terrible, I have average knowledge. 13/20, better than I expected! Now I really want to buy a copy of every battle droid set. 14/20. Some of the questions are a real challenge. In some of them only a lucky guess saves you from failure. 5/20. Wow. My interest for LEGO Star Wars began in 2014 when the Star Wars Rebels sets arrived - which is also therefore that question was the only one I really knew - the others were just guess. 11 ... I', pleased! And I nearly stopped collecting Star Wars about 10 years ago! 14/20. Many successful guesses were required to reach that score. 16/20 without researching. Though, the question about the pearl gold hilt should say 'warm gold' next to it since that is the name listed on Brickset for the color. 15/20 - Not too bad, but I don't have quite the enthusiasm that I did a few years ago. Too many uninspired re-hashes, but I'll admit the last couple of films haven't helped either. Perhaps we'll get something truly stunning this year; a nice UCS Star Destroyer would be enough to re-start my collecting! 14/20 just by winging it. Fun! Wow, that was tougher than expected. Still happy with my 10/20, though. Also, that question about Assault On Hoth felt like a real passive-agressive smack in TLG's face - that set is known for it's many criticisms, including a lack of a proper Imperial army. 19/20, of course I get the last one wrong. 17/20, glad to know that the hours I spent poring over the original visual dictionary were not wasted. Thanks for the fun challenge! I am confused about the lego star wars set line. First we for some pretty poorly designed sets at the beginning. Then they got better and better. They were really good from 2012 to 2015. Now look. All we get is a bunch of stupid trash toys for babies saying battle action. I've moved on; Lego Ninjago's looking pretty good to me. 19/20, missed the question about which X-Wing Pilot is missing. Seriously surprised we haven’t gotten Red Leader yet! 7/20, and I should have done better. I can't believe I got the Assault on Hoth question incorrect! This was really entertaining, and just the right level of difficulty! Please do more of these! These are great! Much surprised that I really made 13/20. Would have never thought I can made "that" much. 16/20 did research for the planet question because I wasn't sure I understood it. quite surprised I did that well since I'm not a big star wars fans, but having received the lego star wars visual dictionary for christmas helped. many questions are pretty hard. Yeah, 15! Some questions are really challenging. Escpecially the droid ones. 18/20, fan of Lego Star Wars since 1999, missed the questions about the reveal of 75159 Death Star and the first ever polybag released. The last question was a lucky guess, though I'm not at all surprised by the answer. 8/20. Proves I am not a huge SW nerd. I quit collecting them in 2013, with the sporadic purchase since then. Too expensive and uninspired builds. Maybe one day I’ll look into some again outside of just battle packs. 15/20. My favorite question was the one about the first bounty hunter minifig being Zam Wessel who is also one of the only ones that hasn’t been remade. I had fourteen out of twenty correct, and I only looked up the one about the amount of snowtroopers in the Assault On Hoth set. The questions were very interesting and fun, thanks! Got em all, but I guessed the polybag debut year and the number of battle droids. 12 cold, that's quite a bit better than random chance would predict. 16. That planets question was sneaky. 19/20. got the last one wrong. I didn't count the commander, security and pilot battle droids as B1 since I always thought the latter were OOM series battle droids. 11/20 on the spot without research, not too bad I'd say. @Aladdin Sane They were counting those too? I took B1 to mean just regular battle droids. I feel like the number would be even far higher if we were counting the pilots and such. I mostly got the questions about LSW's early years correct, and missed the later ones... I stopped paying attention to Lego's product lineup around 2010 and only jumped back in again these last couple years. So I nailed things like 'first female minifigure', 'first Bounty Hunter', 'original AotC battle droid colour', 'first Legends vehicle' really easily, and for the others either took random guesses or used a bit of deduction based on the little I did know. The only one I let myself check was the planets one. For questions 1, 5 and 9 I had narrowed my answer down to two choices by ruling out two answers for each that I knew for a fact were incorrect... I just guessed the wrong way with my final choice. And I can't believe I failed the polybag set one, though... I literally owned the polybag in question, I just completely forgot to factor it into account. Oh do you all know that lego are producing Star trek sets next year, Im well excited..
17/20. Not so bad from just memory. 12/20, and half of those were lucky guesses, lol. I think that the animal question needs to be clarified, as instead of animal, it should be “big molded piece for an animal”, because the new UCS millennium falcon actually included a gundark, it just wasn’t a specific mold. @BrickBuilderHero - Thanks. I have clarified the question so it now mentions both pearl gold and warm gold. @AladdinInsane - I used the term 'B1' to distinguish from B2 Super Battle Droids and other Battle Droid types but you make a fair point about OOM-series droids. I have adjusted the wording of the question to include those as well. @someguy827 - 75192 Millennium Falcon includes a Mynock rather than a Gundark. 20/20. Lucky guesses on some, but I did it! 11/20... not so bad after all but the questions were harsh. 16/20 - could of easily been 18/20 but I didn't think hard enough about the planet series question, and guessed wrong for the death star reveal question. Last question was the most difficult in my opinion, even doing some research. Little quizzes like this are a fun diversion! Which set was the first to include a vehicle from Star Wars Legends? One other of the sets was produced in 2000 (unless that was a trick question and not all are actually Legends vehicles). 9/20 I actually thought it would be much worse as I am not a Star Wars an at all. Certainly got many by pure luck. I got 15/20, though I had never actually heard before how the second version of the play set Death Star was revealed so that was just a stab in the dark, same with the droids question where I thought 129 but it was 160 or so. The ‘same pieces’ question mislead me slightly because I thought the two Millennium Falcon set names were the rereleases with a different box design. I should’ve known the poly bag and minifigure every year questions though, I thought the latter was Luke but he was missing for only 2 years over the 20 so no wonder! 18/20 without looking up info, not bad. The battle droid question was just a guess. 17/20 I’m pretty proud of myself, although I probably had a few lucky guesses. I almost fell for the planets one. Endor and Yavin are moons, not planets. 6/20 that was a tough quiz. But lots of fun. At least it inspired me to go and count my battledroids someday soon. 10/20. Proving that 1) guessing can get you quite a few points and 2) it’s clear I don’t collect Star Wars sets! 9/20. Can't believe I got the Ewok question right. 15/20 Did better than I expected. 15. Got the planets one, the Jango Fett one and the stud shooters one so pretty pleased with myself. 7/20. Fun to give it a try! I got 7/20, not bad for someone who doesn't know everything about LEGO Star Wars! I got 16/20, without researching. I have a large knowledge of Star Wars, but less so of Lego Star Wars. That was kinda fun! Most I knew, some I guessed, and there were a few really tricky questions, especially when they were about minifigures, since that's not my specialty. 10/20 using mostly guess work. Not bad! Got 7/20 and quite impressed with that as I was about 80% sure on roughly 2 questions. The rest was total guess. I'm more into Technic but I think I would also do poorly on a test like that on Technic because I do not calculate when such and such piece starts to exist and in how many colours etc, etc. Very fun to do anyway and quite impressed by the extensive knowledge of quite a few participants. Kudos! I wasn’t really into LEGO until 2008, so I don’t know as much about LEGO Star Wars during its earlier years, mainly because I turned 8 that year and the Star Wars: The Clone Wars animated movie came out in theaters. Great quiz though!! Got u7 out of 20. The questions from the beginning goofed me up the most. Was the OOT battle droids similar to the B1 battle droids or different? Special thanks to the first edition of the Lego Star Wars Visual Dictionary from when I was younger. Loved this, can't wait for more. I got 13/20. I know more than I thought I knew! Pretty good. Star Wars was my childhood passion. 18/20 on the spot, didn't get the one with the character produced every single year or the one with the x-wing pilots. That was quite enjoyable and I'd be perfectly happy to do more trivia contests like this one. 7/20. I think I need to spend more time on this website! My brother got 10/20 just from hearing me talk about Lego Star Wars for 10 years. 16/20. Pleased with that considering Star Wars is only 4% of my collection. 8! But I don’t really collect the theme and guessed on 17 of them! 15/20, I'm a lot more versed with older sets. Thanks for putting this quiz together. I scored 15/20. Not too bad. 17/20. I want more Battle Droids now. i got 7/20 having guessed every answer. 18, all off the top of my head or lucky guesses, I got the battle droid and red leader question's wrong. 18/20. Had no idea about the how the Death Star was revealed! ah that question on geonosian droids. I said dark orange, and I've just checked the dictionary, there are dark orange geonosian droids. just not the originals. I think I actually knew one, and then got four lucky guesses (and 15 unlucky guesses). But I enjoyed it! Like some others have said, I’d love to see some quizzes for other themes too! More trivia questions on any other topic. This seemed fun for most. 17/20 - I can live with that. Quite satisfying to get most of these right based on my knowledge, although I too had to make a few guesses. 12/20 Not bad for no research or particular fanatic interest. A few of those were educated guesses but most I had a surprisingly good idea on. This quiz thing is a fun idea, more please! I got 16/20! I'm really pleased, a few random guesses that turned out right, but did 3 in a row wrong! Overall so happy with my score! I cant wait to see what else they've got is store for us! 8/20 and 4 of those were lucky guesses. Didn't know as much about LEGO Star Wars as I thought. 10/20 - love Star Wars but don’t own any of the sets so was mainly making educated guesses, quite pleased! 5/20: Need to brush up on my knowledge. 12/20... Better than I expected. And some questions were hard. I like it thank you. 8/20 :| But it was fun! 12/20. I was confident about 7 or 8 maybe, the rest were guesses. This was fun. I would like to see more content like this on Brickset. Fun and original quiz question! Big Star Wars fan but not easy. 12/20 is not the worst score is it. ?? I got a terrible score but it was great fun, thank you, great idea! Learning a thing or 20 and looking forward to the next quiz! 10/20.... thought I knew more than that! I got them all right! 6/20. I don't watch star wars and like 18 of the questions I guessed on. oof, 12/20, thought it'd be higher. still, reading the comments that seems about average, I can lie with that! Wow, got 13 out of 20 right. No research. Eyes closed. Clicked answers with my ear. I’m even more impressed with myself than I usually am. 11/20. Got all of the character-related questions correct, missed almost all of the year-of-release and number-of-parts type of questions. My brain can only hold so much knowledge (and there's no flippin' way I'm spending time analyzing the database for something like this...). Lol I've been buying LEGO Star Wars since 1999 and still only got 8/20. That means you had a good quiz. haha love it. 13/20. Not bad for not knowing a lot of answers. 13/20. A couple of lucky guesses, but I knew half of them for sure. 4/20. I can live with that. I was guessing for most of them. A pathetic 7/20 & considering I've been collecting the Star Wars theme since Day 1 (1999), I hold my head in shame. 12/20. Not good with clone wars/cartoons based on star wars. I’m disappointed in myself I only got 13/20 right. This was a great idea and I loved it, looking forward to hopefully seeing more of these trivia tests in the future! 20/20 ! This was surprisingly quite easy to me . I guess reading all the Lego Star Wars visual dictionaries and encyclopaedias in the past helped! Would love to see more of these! 19/20 with only my knowledge and some educated guessing. Missed the Death Star reveal question. Wow. Those were hard! 6/20. And 2 of those were lucky guesses. Could have gotten the Planets one were it not for the trick question moon/planet distinction. Ah well. 15/20! of course it would not counting my accidentally reading Jango Fett as Boba Fett! 14/20... no assistance needed. Nice Lego Star Wars trivia! "10178 Motorised Walking AT-AT and 75054 AT-AT both included 1137 pieces"
I am very irrationally angry that nobody had decided to include an extra piece in these sets to bring it up to 1138. 8/20... as always with tests I talk myself out of my first choice, as if the test is trying to trick me or something. 13/20 THAT WAS HARDER THAN I EXPECTED. of course i was 50/50 on the questions i had to guess between the the two obvious answers! some of those were really rare facts. 8/20, there were many obscure answers that i wouldnt have known as i dont watch the cartoons nor do i remember specific names of minor characters. A few times i got one wrong only to have my second guess be the correct answer. I got 20/20! I barely know about lego star wars? 15/20 - that was fun! 14/20. Not too bad considering I don't actively collect the theme, although I had SEVERAL lucky guesses. This was a fun idea! I got a 20/20. This was fun and tested how well I knew the Star Wars theme that I collect! A feeble but still totally fluked 6/20, likely brought on by zero knowledge of Star Wars or Star Wars LEGO sets!